Kids first, then ice cream: #MiracleTreatDay is August 2! – Dairy Queen Corp. Kids first, then ice cream: #MiracleTreatDay is August 2! 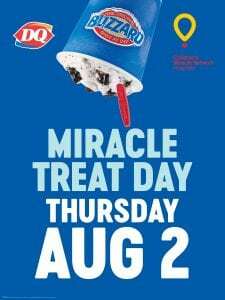 Help kids get back to being kids on August 2nd by celebrating Miracle Treat Day! When you purchase a Blizzard Treat from participating US Dairy Queen locations, $1 or more from every Blizzard Treat sold will go to Children’s Healthcare of Atlanta, making miracles for Atlanta’s kids. Kids like Larenz. Larenz Soares is a happy 11-year-old who is motivated to excel and help others. But, he struggles daily to manage a chronic illness that leaves him in unspeakable pain and often hospitalized. At 3 years old, Larenz was diagnosed with sickle beta thalassemia, a rare form of sickle cell disease that causes many health problems. Most patients are diagnosed at birth. However, Larenz had been healthy until he was 3. It was only when he awoke one morning with a yellow tint in his eyes that his mom, Greta, knew there was a problem. Larenz has undergone a few surgeries since his diagnosis, one to remove his spleen and another to extract his gallbladder. But, it is the pain that keeps Larenz in and out of the hospital. 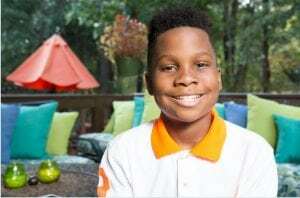 Greta can sometimes help her son manage his pain, but once he passes a certain threshold, the only relief comes from treatment at the Aflac Cancer and Blood Disorders Center of Children’s Healthcare of Atlanta. Larenz is admitted to the hospital frequently and typically stays for days at a time, often missing school. Resources, such as the Children’s School Program, have helped Larenz stay on track. He has maintained academic honors throughout grade school. Greta says Larenz perseveres through his illness and inspires others. Dairy Queen has been a proud partner of Children’s Miracle Network Hospitals since 1984 and has raised more than $130 million for local children’s hospitals. Their support has impacted our hospital in numerous ways–from funding cutting edge research and updating equipment to offering puppy play dates and wagon rides.